Two very different one-act plays come together in this double-bill, providing the audience with an opportunity to see new writing in a way that doesn’t involve a scratch night, where several plays or excerpts of plays are put on in a single evening, which can be quite an intense experience – and doesn’t involve going out for an evening to see a one-act play. 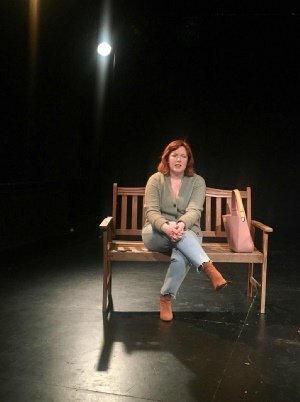 The one-act play, mind you, is for some reviewers, quite convenient, as they can get back at a more reasonable time of night and so on, but for most, it is something to be weighed up as much as it is for any other members of the audience: do they really want to trek into central London just for an hour-long show? Stream sits as a happy, if reflective, medium between the scratch night and the ‘one act, one hour’ production. In Salmon, Angus (Josh Smith) is in his bedroom, apparently with a bed without a bed frame (or it could be that I’m just taking the set too literally), a young man who is the local postmaster. Except we’re not talking about a London suburb – this is on a Scottish island, away from the mainland, which doesn’t have its own school as the population isn’t large enough for one. So, Angus commuted to a school on another island nearby, which in adulthood has resulted in more isolation than he would like, because a lot of his friends from school days are on that other island and some others have moved away as employment opportunities are limited locally. He talks about getting stuck in the rut of the daily routine – his life doesn’t seem to have much purpose beyond getting up, going to work, going home again, having an evening meal and sleeping. At one point he had a dog, Dane, a German Shepherd, but the loss of this companion is hard to take. The untidiness of his bedroom contrasts with the clean tablecloth and the pristine condition of the kitchen – Angus’ parents Elspeth (Molly Barber) and Craig (James Murphy) are unsure of how to approach their son’s depressive state. It isn’t just losing the dog that has turned Angus into someone who stops his regular social life, leaving Skye (May MacLeod) irritated that none of her calls are being returned. It is easy, at least for me, to conclude that he should have given more serious consideration to spreading his wings and perhaps look at opportunities on the mainland, or even further afield. But in this case, this is rather missing the point: he would still be trying to find his way in life wherever he was geographically located. Eve and Sea Productions are taking the show to Edinburgh Fringe 2019 – at the risk of sounding unkind, this quarter-life crisis play would sit well with the various other quarter-life crisis plays the Fringe offers these days. Still, it resonated with the audience at the performance I attended, and the rural setting of the narrative provided a curious ‘looking from the outside in’ perspective for Londoners. Mom Bob sees Claire (Jane Hancock) sitting in a local park, talking to the ducks in a pond (I’ve made it sound more dubious than it comes across on stage) about a decision which she made to give up her daughter Molly for adoption. She has since met her, or rather Molly took the initiative and reached out to Claire, and a lot of the monologue is about that meeting and what went brilliantly and what may or may not have quite worked out so well. The detail in the story gives it a lot of credibility – such as, for instance, why it was that Claire took the train to meet Molly when a plane trip would have saved a lot of time. There are a fair number of questions and imponderables in this play, and on the whole, it is a subtle and thoughtful piece of theatre. She was in a bad relationship previously, and whilst she is inevitably happier out of it, there’s palpable frustration at the general consensus that happiness can be found in a relationship. By the end, there’s still uncertainty with regards to whether Molly will continue a dialogue with her biological mother, but nonetheless, there was a lot to think about in this show: I can relate to Claire’s ability to afford things that she would otherwise have to forgo if she had raised a family instead. All things considered, both plays were personal and heartfelt productions. SALMON by Constance Eldon McCaig and Eva Lily is set in a small Scottish town, where a lack of prospects leaves the young people looking for more. MOM BOB by Jane Hancock, examines the relationship between young mother and biological child and the identity you find in being needed. Two plays by up-and-coming female playwrights.